Continue your sightseeing drive by passing through the Painted Desert, stopping by the Cameron Trading Post where you can purchase a variety of artwork crafted by the local Navajo, Zuni, and Hopi tribes. 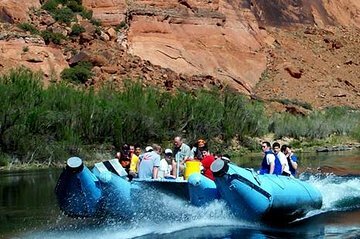 You’ll proceed from here to Page, where you’ll board your boat for a smooth-water float down the Colorado River. Stare up in wonder at the towering 1,000-foot (300-meter) tall walls of Glen Canyon, and search for ancient petroglyphs during a beach stop where you’ll enjoy an included lunch. More adventurous souls can even dive into the icy-cold Colorado River if they dare. Continue floating past Lee’s Ferry and the famous “Balanced Rocks before walking across the Navajo Bridge. You’ll finish your excursion with a drive back to your hotel in Flagstaff, watching as the sun casts a fiery glow across the Painted Desert landscape. It was more than expected and every minute was great. Midway through the float it started to rain, not so bad. Then it turned into a torrential down pour with high winds-the results after the storm-multiple waterfalls. Fabulous. Steve, our guide is knowledgeable of the area and made the trip that much more interesting by pointing out some of the highlights/history contained within those 15 miles. The tour was outstanding and informative. Worth the money.